Boise State receiver Jerard Rabb made a grab over Hawaii's Kenny Patton during the first half of last night's WAC game at Aloha Stadium. Special teams wasn't one-third of the game for Hawaii last night. It turned out to be everything, as monumental kicking-game failures in the second half wasted offense and defense that should have been good enough to beat Western Athletic Conference kingpin Boise State. Three BSU returns -- two off blocked kicks -- added up to 16 points and made the difference in a 44-41 victory over UH as 25,661 watched at rain-soaked Aloha Stadium. "It was like somebody knocking all the air out of you," said Hawaii receiver Ryan Grice-Mullen, whose two fourth-quarter touchdowns went for naught. The Warriors, who led most the game, were poised to tie it at 42 with 3:03 left. UH lined up for an extra point after Colt Brennan's second TD pass to Grice-Mullen. But Daryn Colledge blocked his second kick of the period, and Orlando Scandrick -- who'd run Colledge's earlier block of a field-goal try back for a TD -- picked up the ball and ran it 85 yards to the Hawaii end zone for the final two points of a game that got wilder and wetter as it went along. "It was a great college football game, it was a blast," Colledge said. Probably not if you were a UH special teams member. "The biggest problem was not that (extra-point) kick," UH special teams coordinator Mouse Davis said. "We had some (special-teams) problems earlier that were huge." In addition to the Colledge-Scandrick combos, there was a 92-yard punt return for a TD by Quinton Jones that gave Boise State the momentum and its first lead late in the third quarter. "We kind of gave it away with some errors, which is frustrating," UH coach June Jones said. Hawaii fell to 1-1 in the Western Athletic Conference and 1-3 overall. The Broncos are 1-0 and 2-2 after winning their 27th consecutive WAC game dating back to 2001, when the streak began here against UH. Brennan passed for 426 yards and two touchdowns each to Davone Bess and Grice-Mullen, and the Warriors outgained the Broncos 556 yards to 430. Grice-Mullen caught nine passes for 188 yards, and Bess latched onto six for 106. 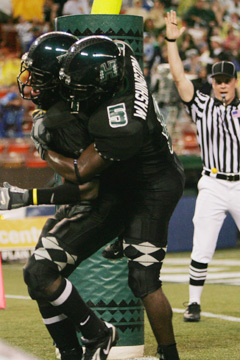 Hawaii's Michael Washington celebrated with Ryan Grice-Mullen after Grice-Mullen scored against Boise State in the fourth quarter last night at Aloha Stadium. Brennan, who completed 29 of 51 passes and was picked off twice, was flushed out of the pocket often and managed to net 37 yards rushing. "To be honest I was a mess out there," Brennan said. "I was having trouble making reads and seeing what the defense was doing." "Colt had a lot of production, but he really doesn't understand what we are doing right now," the coach said. The Hawaii defense made it six quarters in a row without allowing any points, and Brennan and Bess connected for scores twice as UH took a 20-7 lead into halftime. Dan Kelly also kicked field goals of 30 and 37 yards and the Warriors outgained the Broncos 308 yards to 161 before the break. "I like the way Hawaii played defense. They put a lot of pressure on you and they confuse you," Broncos coach Dan Hawkins said. "They do a lot of unorthodox things, all good stuff." UH outside linebacker Kila Kamakawiwo'ole had another big game, with a game-high 10 tackles, two sacks and a forced fumble. Warriors defensive coordinator Jerry Glanville won the scheming battle against Broncos offensive coordinator Chris Petersen (the UH defense allowed just three of the touchdowns). That didn't matter to Glanville. "The thing with these moral victories is they're over in 5 hours," Glanville said. "In 5 hours it's a loss." Boise State closed the gap to 20-14 at 7:04 of the third when Jared Zabransky connected with Jerard Rabb for a 3-yard touchdown pass, capping a 14-play, 70-yard drive. Hawaii running back Nate Ilaoa broke a tackle against Boise State during last night's game. Ilaoa carried the ball 10 times for 76 yards and a touchdown. Zabransky, who ran for four touchdowns against UH in a 69-3 rout of the Warriors at Boise last year, was contained for 59 yards rushing and 207 passing. UH then failed to get a first down and the Broncos stunned the crowd with Jones' TD, the longest punt return by an opponent in UH history. The previous long was 87 yards by Rick Calhoun of Fullerton State in 1986. The Warriors were forced to punt again without making a first down, but got a huge break this time when Jones fumbled and Ikaika Curnan recovered at the Boise 45. Two plays later, Nate Ilaoa burst straight through the middle on a draw play for a 37-yard TD. Brennan completed a 2-point conversion pass to Jordan Slye, and UH had regained the lead, 28-21. UH appeared to stop BSU's next possession at the Broncos 36. But punter Kyle Stringer dropped the snap. He recovered his own fumble and ran 13 yards for a first down. Antwaun Carter ran 33 yards to the Hawaii 7, and Zabransky eventually found Legedu Naanee for a 6-yard touchdown pass and the score was tied at 28. Scandrick then returned the field-goal block by Colledge 69 yards, and BSU led 35-28 at 11:23. Scandrick was also a key figure on the next play from scrimmage, as a scrambling Brennan found Grice-Mullen a step behind Scandrick, who tried to push Grice-Mullen out of bounds after he caught the pass. Grice-Mullen stayed in bounds and ran 25 more yards into the end zone to complete a 73-yard touchdown play. It was tied again, at 35, with 11:01 left. Zabransky then threw a 5-yard TD pass, again to Naanee, concluding a 91-yard drive and giving BSU a 42-35 lead. "Anytime you lose at home, especially when you blow a lead like that, there's a hundred what-ifs," UH linebacker Tanuvasa Moe said. "But you can't second-guess yourself." 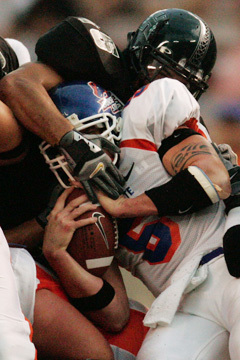 Hawaii's Tanuvasa Moe shut down Boise State quarterback Jared Zabransky as Zabransky carried the ball in the first quarter last night. Hawaii receiver Davone Bess celebrated with Ross Dickerson and Brandon Eaton after scoring a touchdown in the first quarter of last night's game against Boise State. Hawaii freshman John Fonoti threw down Boise State junior Quinton Jones during the first quarter of last night's game. Warrior defenders Solomon Elimimian, left, Lono Manners, top, and Tanuvasa Moe smothered Boise State running back Ian Johnson last night.